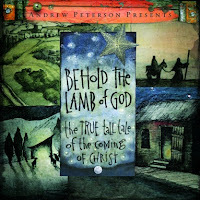 Andrew Peterson's Behold the Lamb of God : Reform worship. Thanks for the 411. I will check it out. By the way we have a picture of Lily on our fridge and every time Asher sees it he insists on giving her a kiss. Look out!!! I couldn't possibly agree more. I've already told about 5 people to buy it this year, and have done the same every year for the past three. I saw the tour in Nashville at the Ryman two years ago. It was an amazing performance with many Square Peggers. Amazing. Wholeheartedly agree brother. I was blown away last year when I both purchased his CD and saw him in concert. Peterson’s album provides a needed Christ-centered emphasis to a culture that promotes a consumer-driven Christmas. I had mistaken the CD for a Book. Great recommendation! !